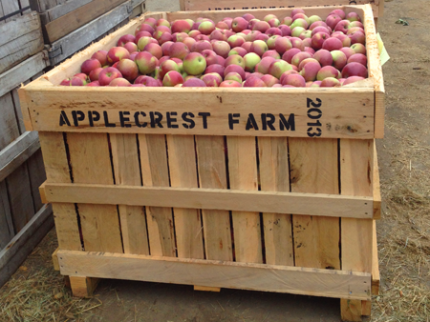 How many hand-picked McIntosh apples does it take to fill a 15-bushel stout oak Applecrest bin? Every Saturday and Sunday through the end of October, visitors to Applecrest have the chance to win a free 1/2 bushel of Pick-Your-Own apples by offering the closest correct answer to that very question. The bountiful bin can be found adjacent to the gourd booth in the main festival area. Contestants may hazard their guesses between the hours of 10:00am and 3:00pm, with the winner announced at 4:00pm. Sunday September 29th’s winner was Thelma R. of Casco, ME. Taking home the prize on Saturday October 5th was young Will Bryant, who beat out his two siblings with a spot-on guess. Congratulations on your fruitful clairvoyance, gang, and happy picking!